The cushions were very tired and I offered to recover them for Lisa. 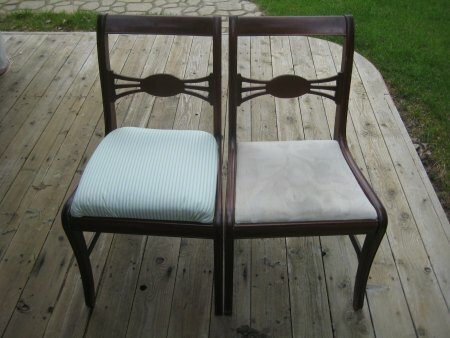 She picked out a nice narrow green-and-white stripe fabric. Usually, when a chair cushion is recovered, the fabric is stapled to the bottom of the chair seat. However, this makes it impossible to launder the covers, should you need to. I decided that if I put a drawstring around the perimeter of the chair cover and drew it up very, very tightly, it would achieve the same purpose as the staples BUT would allow Lisa to easily remove and replace them. So, that's what I did. I was kinda/sorta right. They *were* easy to remove and replace. BUT they didn't look very professional and I'm not entirely pleased with them. They serve their purpose and if Lisa wants them re-done properly at some future date, I'll be happy to do so.